The Cocoa Research Association Ltd.
CRA Ltd. was established in 1973 to manage a Trust Fund set up by the late John Cadbury to support cocoa research, especially work carried out in Trinidad. Up until 2008, CRA Ltd. was administered by the UK Biscuit, Cake, Chocolate and Confectionery Association (BCCCA) and the income from its Trust Fund was used to complement the BCCCA's cocoa research programme. When the members of BCCCA decided to wind-up that association, it was agreed that its cocoa research programme should be transferred to CRA Ltd. In September 2008, CRA Ltd. took over BCCCA's existing cocoa research commitments and now administers the contributions from UK chocolate manufacturers (Mars Inc. and Mondelēz International), ICE Futures Europe and other sources to support this ongoing research and future projects which are capable of benefiting cocoa growing throughout the world. CRA's long-term support for the germplasm conservation and utilisation activities at the Cocoa Research Centre (CRC) of the University of the West Indies in Trinidad have been contributing to the global breeding effort since its inception. 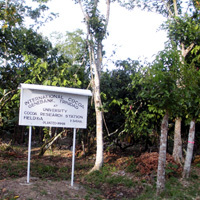 CRA's reputation for research related to cocoa genetic resources was further strengthened when it took over key projects formerly supported by the BCCCA including the International Cocoa Quarantine Centre and the International Cocoa Germplasm Database projects at the University of Reading in addition to a substantial contribution to the research at CRU. Although on-going commitments to these projects account for a very large part of its research funding, CRA also funds shorter projects, including support for post-graduate students, contributes to international collaborative projects and supports initiatives to help coordinate genetics/breeding research such as CacaoNet and INGENIC. Improved technologies for agronomy, including shade management and the propagation and establishment of new planting materials.